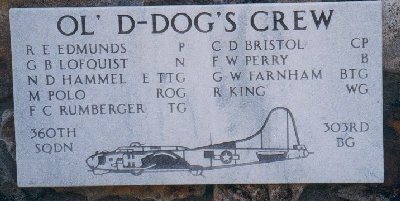 Crew incident: On 28 March 1945 mission #347 to Berlin, Germany in B-17G #43-38451 (No name) (359BS) PU-O. Lt Edmunds calculated that only 40 minutes of fuel remained upon reaching the English Coast. He was instructed to land at the Manston Emergency Airfield, but Manston weather was very restricted. A VHF radio message indicated that the Splasher #8 area was clear. Upon reaching this area, weather had "dropped to the ground." A wheels up landing was made on the beach at Rye Harbour. The ball and chin turrets were damaged and the B-17 was salvaged. No crew members were injured. Substitute Crewmen: 2Lt Ralph L. Johnson (CP) for 2Lt Bristol (CP); 2Lt Joseph Potts, Jr (B) for 2Lt Franklin W. Perry (B). 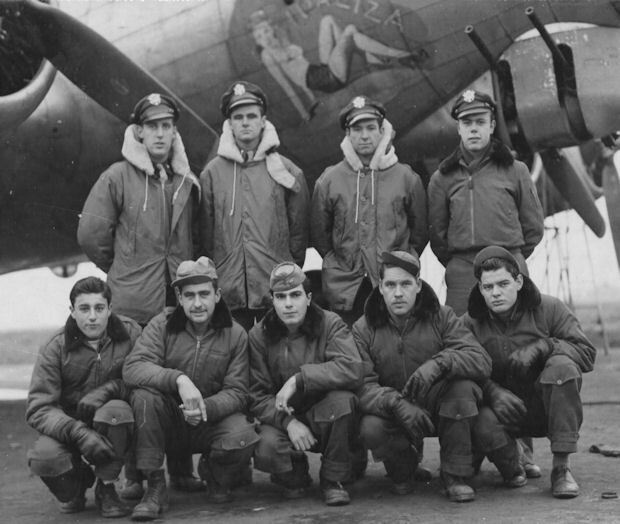 Sgt Raymond H. King (WG) had been deleted from the crew when the crew was changed from 9 to 8 men.